Today Alyce got to meet her new brother. Brother Luke as she likes to call him was born last night. Alyce is staying with Grams and Pa Pa so that Mom and I can get situated with her new brother. Grams and Pa Pa brought Alyce to the Hospital just before lunch. I met them at the entrance because I wanted to introduce Alyce to her brother. I took Alyce to the gift shop to get Mom some flowers and then we went upstairs. When Alyce first saw Mommy she didn't quite know what to think. She seemed reserved and almost scared of Mom. I think seeing her in a hospital bed was quite unnerving. She got over her initial apprehension and started crawling over the couch in the room not even noticing her brother in the bassinet. That all changed when she hear brother Luke make some noise and move a bit. Alyce squealed, said "Baby! ", and dropped everything to see her baby brother. We gave her a bench to stand on so she could get a better look. She was enamored with Luke. She continued to look at him for quite a while, but never reached out a hand to touch him. After a while Alyce grew a bit tired of Luke; this was when we gave her, her presents from Luke. Mom had purchased some sticker activity books ahead of time for this moment. Mom is so smart when it comes to stuff like this. To give Mom a break and some Alyce and me time I took Alyce downstairs to the cafeteria to each some lunch, just the two of us. The trip was uneventful and didn't warrant a lot of attention here, but one moment did stand out. While sharing a hamburger Alyce spotted my Daddy bracelet that allows Luke to be left in my care. Alyce pointed to the bracelet, said "Mommy", and burst into tears. 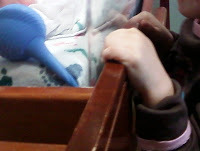 I'm not exactly sure what she was crying about; most likely worried about Mommy sitting in the hospital bed. We got past all that and she was fine for the rest of lunch and the afternoon. 0 comments on "Alyce Meets Her New Brother"